I'm very excited to show you this dress from the brand new Named pattern collection, 'New Black'. I was a pattern tester for the Olivia wrap dress and the Esme Cardigan (blogged here) from this collection and received both patterns free in return for my honest feedback. I have to say that Saara and Laura from Named are incredibly professional in their testing process, while also being so sweet and friendly. It was an absolute pleasure to test their patterns. I was very impressed with the new collection and was immediately drawn to this dress. 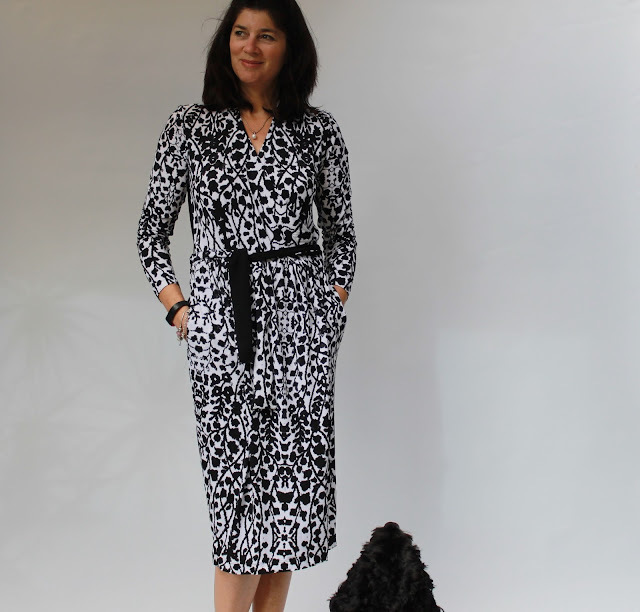 Everyone loves a wrap dress and this one is possibly made even more flattering with the waist pleats and soft back gathers. 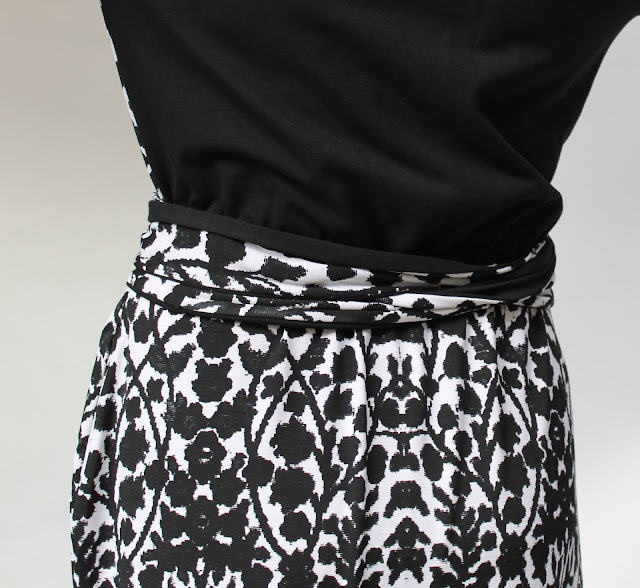 The pockets add another practical and stylish element to the design. 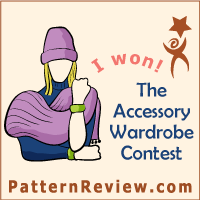 Since I have made many Named patterns before, I was confident about the sizing (I wear a 40). I decided to plunge straight in with my chosen fabric, a stretchy and drapey knit (92% polyester, 8% spandex) from Potter's Textiles. I just had one small problem - the fabric I had chosen was a remnant and there was only 1.60m available. The pattern calls for 2.90m. Determined to make it work, I used some creative cutting and a piece of black cotton lycra for the upper back and one side of the tie. I'm hoping the black piece looks like an edgy and cool design feature, rather than a lack of matching fabric! I am pleased with my double-sided black and printed tie (the pattern uses one piece folded over for the tie, so this was a variation). The black gives some extra definition to the waist and smooths the transition between the two fabrics at the back. 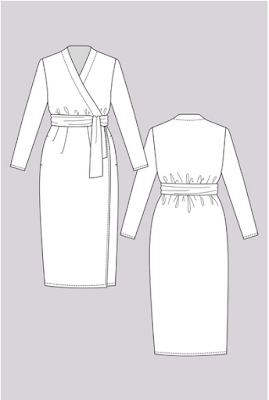 The sewing process went very smoothly and this pattern is well drafted as is usual for Named patterns. The instructions are clear and straightforward. I would say this is an intermediate level pattern. I had a few issues with this fabric as it was terribly slippery and wouldn't hold a crease. I used Washaway Wonder Tape to hold the front skirt edge in place before stitching and fusible hemming tape on the hem for the same reason. I used a coverstitch for the hem. The fit of the dress is good. It is incredibly comfortable to wear and the front wrap sits beautifully against the body. Obligatory 'no gaping' shot below! Although I feel super comfortable in this design, there is one aspect that is slightly removed from my usual style. The hemline length. I always make my dresses above the knee. I'm not quite sure why, but that length just seems to look right to me. Possibly because that's all I ever wear! Anyway, since I was staying true to this pattern for the testing process, I decided to be radical and go below the knee for the length. The verdict: I love this length for this dress. It does feel strange though. I feel like a grown-up for the first time in my life! Here I am imagining myself as a grown-up. It is so interesting the way different clothes can affect someone's confidence and attitude. I love this dress. The fabric worked well for the design and the style is classic and flattering. I feel like I'm 'in with the in-crowd' in this dress (from a very old song - sorry younguns)! Yes Truffle, you're in the monochrome in-crowd too. You look gorgeous Megan, this is a lovely style and the fabric save totally works imo! Well if you like it, that's good enough for me. Thank you! You are right. I am just a slow learner! What a lovely dress! It fits you perfect and you look great! Thank you so much. I can recommend it! You and your magical remnants! The back does look edgy. Nice job. You are so clever with remnants, that black back really lifts the dress to another level. Yes, this will be a really good contender for frocktails - lucky you! Very pretty. I think just above the knee is the best cut for me, too, but variation is good. Anyway I didn't know until I tried a dress this length, the way a soft knit fabric catches on the top of the calf when walking is also very flattering. So in motion I think it is just as charming as a shorter dress just harder to gauge that in the mirror when I'm planning a hem. But it does feel different and, yes, more grown up. Lovely fabrics. Very elegant dress. Love the black design feature. Magic! Love the way the black flowers cascade down the dress. Looks great. This is the pattern I like most from the collection. Great to know it all works especially the neckline. The plain black looks great! I say inspired design feature! Megs, that length looks very pretty on you. Tres Chic, Cherie. I really like the black back, it tones the business of the black and white print. I really like black and white at any time but it is so on trend right now.